The pineal (pronounced: pih-nee-ul or pai-nee-ul) gland is a small endocrine gland shaped like a pine cone (hence its name) located in the center of the brain of humans and other vertebrates. This contributes to the alertness or consciousness of one's self and produces "melatonin" which regulates the sleep/wake patterns, and even seasonal functions (e.g. more wakefulness and productivity in the summer versus more restfulness, and in some animals, hibernation in the winter. Pineal gland stimulation is done by focusing and concentrating at the center of the head. First, settle down. Focus at the center of your head. Visualize your head as an empty ball, and see at its center a brilliant white light the size of a marble. The moment you see the light, start employing positive emotions to reinforce your visualization. Feel JVPLK (Joy, Vitality, Peace, Love & Kindness) one after another. And as you emote these feelings, you should see the light to glow much brighter than before. Continue this visualization for 5 to 15 minutes to quicken the pineal gland. This quickening leads to the secretion of vital hormones needed by the physiological processes of the body. The pineal gland practice enables one to develop willpower and the power of concentration; stimulate creativity; develop musical and artistic abilities, multiple intelligences; appreciation for art and culture; the power of discrimination, observation; and awaken intuition. Benefits: The pineal gland practice enables one to develop willpower and the power of concentration; stimulate creativity; develop musical and artistic abilities, multiple intelligences; appreciation for art and culture; the power of discrimination, observation; and awaken intuition. 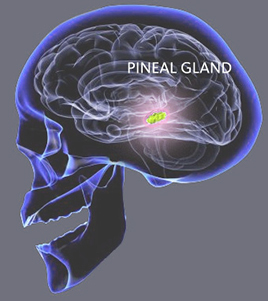 Stimulation of the pineal gland, the highest gland in the human body, mobilizes the stimulation of all the lower glands. And this brings about balancing where there are hormonal imbalances. Quickening of the pineal gland can also put a stop to genetically transmitted diseases, like hypertension, diabetes and asthma.